Former President Romana (Lalla Ward) is now the head of the Celestial Intervention Agency. Her team includes former bodyguard Leela (Louise Jameson), childhood mentor Braxiatel (Miles Richardson), new recruit Ace (Sophie Aldred), reluctant ally Narvin (Sean Carlsen) and the renegade known as the Master (Derek Jacobi). The moment has come for the Time Lords to declare war on the Daleks. 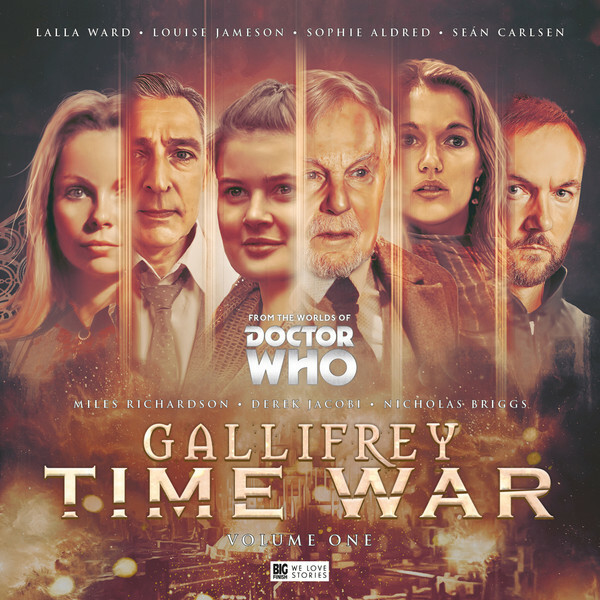 This quartet of stories chronicles the fighting in its early days, with dangerous missions, unlikely alliances, desperate Time Lords and bloodthirsty Daleks… Whilst other Time War sets have followed either the Doctor or the Master, this 5CD set is the first to show the conflict from the perspective of ‘the war room’, right at the heart of the political machinations of Gallifrey. Following a large ensemble also gives this set a unique sense of scale, showing how the war has changed the lives of so many familiar characters.